12 Songs by Wolfgang Amadeus Mozart with texts in Italian, French and German. 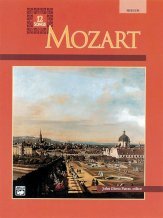 Mozart's brilliant piano technique and his intimate knowledge of beautiful sin ging is combined to create cameos of human psychology such as reverence, infat uation, humor, jealously, and playfulness, all in masterful songs. Includes wo rd-by-word translations of the Italian, French, and German text as well as a t ranslation into the International Phonetic Alphabet.